Safe and secure container storage units for business and domestic use. Whether running out of space or simply out to protect your property, our container storage units can help. We went into business to bring London, Surrey, Sussex, Kent and the Southeast a more affordable, accessible approach to domestic and business self-storage. What makes the difference is the flexibility of the services we offer and our total commitment to customer care. Our container storage units are available in a range of convenient sizes – from 32sqft up to 160sqft at ground-level and elevated as required. We guarantee not only ideal conditions for whatever you choose to store, but also the peace of mind that comes with round-the-clock security. Not to mention, full 24/7 access (upon request) for your convenience. What’s more, each of our container storage units of every size is available for short and long-term use alike with no binding contracts to sign. We take pride in remaining as flexible as possible with all storage units, which in turn helps us keep our prices far lower than the market average. If you have any questions about any of our storage units, we’d be delighted to hear from you. Or if you can’t find the exact services you’re looking for on our website, get in touch with the team to discuss a custom storage solution. Discover a new standard in personal and business storage, proudly servicing London and the South East. Safe and secure storage units, dry and clean with 24-hour access (upon request)– all with the guarantee of the lowest possible prices. Whatever your storage needs and duration required, we can offer you the most flexible, accessible and affordable storage solutions in the area. We know that what matters most to our customers is peace of mind. Safe and secure storage units, quality facilities and dedicated customer care. From our state-of-the-art facility just off the M25, we exclusively offer secure storage units with 24-hour access. Every unit is protected by 24/7 security for the total confidence of our customers. Available in a variety of sizes, our units are perfectly suited to all commercial, industrial and domestic needs. What’s more, with no contractual obligations to worry about, our customers enjoy unrivalled flexibility. Our company takes the safety and security of our customers’ possessions extremely seriously. Which is why we’re constantly monitoring our storage units to guarantee their safety, cleanliness and performance in general. So whatever you choose to store with us, you’ll know it’s in the safest possible hands. Choose from a variety of shipping container sizes to suit every requirement and budget. We offer safe and secure storage containers in different sizes – ideal for commercial, industrial and domestic storage alike. Whether looking for temporary, long-term or even permanent storage solutions, you’ll find it all at our conveniently located site. And if looking to set up a workshop, we can also provide customers with access to a mains power supply, for an additional fee. We work hard to offer a range of container dimensions to suit all needs. Our services include 10ft containers, 20ft containers and 40ft containers of the highest quality. If you’re unsure as to the ideal shipping container sizes for your needs, use the images below as a useful guide. Alternatively, get in touch with our dedicated customer service team today to discuss your needs. If you can’t find the perfect shipping container size to suit your needs on our website, give us a call to discuss a custom storage solution. What makes the difference with the storage solutions we offer? Put simply – unrivalled flexibility. We understand that the needs of every customer we serve are unique. So rather than providing ‘off-the-shelf’ storage services, we instead offer comprehensively flexible short and long-term storage to suit all purposes and budgets. Whatever you’re looking to store and however long you intend to store it for, we’ll provide you with the total service package for the lowest possible price. Looking to store a few domestic items for a few weeks? No problem. In need of a long-term storage solution for business purposes? We’ve got you covered. Unexpected circumstances calling for an immediate storage solution? Last-minute storage is right up our street. What’s more, all of our short and long-term storage services are covered by the same round-the-clock security, along with 24/7 access (upon request) for total convenience. What’s more, we’re also happy to offer special deals on longer-term storage contracts – contact the team to find out more. If you need to change or even cancel your package at any time, you’re free to do so – just give us 14-days’ notice. We went into business to make long and short-term storage as simple, flexible and affordable as possible for everyone. For more information on any of our long or short-storage services, our dedicated customer care team is standing by to take your call. Though insurance is not included in the price as standard, it can be arranged upon request. Each and every container across our site is monitored by security on a 24/7 basis for total peace of mind. What’s more, our site is manned during office hours and we are constantly inspecting both the site and our storage units for quality and protection. If you would like to find out more about optional insurance for your property, get in touch with our customer service team. What kind of products can I store in a container? Our containers are ideal for pallet & crate storage, with forklift services available on-site where required. There are technically no restrictions as to what kinds of products can be stored in a container. Just as long as the items are both safe and legal, they can be stored safely in our containers. If you are looking to store anything that may be considered hazardous or dangerous and therefore may be prohibited, please contact our customer service team directly. Do you provide boxes and moving supplies? Yes, we can provide boxes and moving supplies. We can help you with anything you need, directly from our office. We advise getting in touch ahead of time to ensure that we have the boxes and moving supplies you need, when you need them. As with the rest of our services, we work hard to provide you with everything needed at the lowest possible price. We invite you to visit our site in person for a chat, or get in touch with our customer care team by phone or email to discuss your needs. Can you provide a removal van or truck to pick up my boxes? We may be able to provide a removal van or truck to pick up boxes on your behalf, depending on your requirements. If you need to organise a removal van or removal truck, give us a call anytime. We also offer storage unit hire services with full transportation to the required location – if you prefer the idea of on-site storage. Once again, we would love to hear from you to discuss your requirements, so be sure to give us a call or pay us a visit. 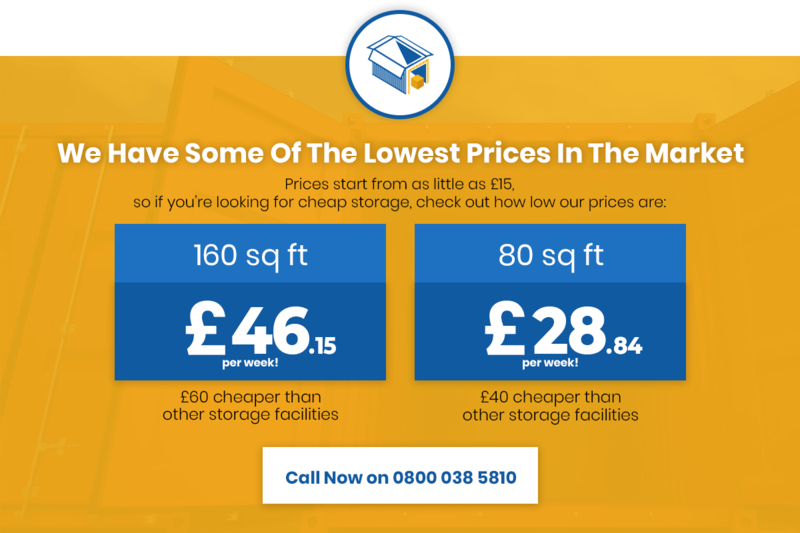 Storage unit cost London, Surrey, Sussex & Kent. The way we see it, premium-quality storage doesn’t have to be expensive. We went into business to offer the first genuinely flexible, accessible and low-cost storage solution for London, Surrey, Sussex & Kent. Covering all domestic and business needs across the board, we offer a comprehensive range of storage solutions and services at rock-bottom prices. We work hard to keep every storage unit cost as low as possible. We understand the importance of peace of mind for our customers, which is why we protect our site with 24/7 security coverage. What’s more, round-the-clock access to your property (upon request) offers outstanding convenience, night and day. Each of our units is regularly inspected for quality, integrity and safety. What’s more, our services are available for long and short-term storage requirements alike. Clean, dry and safe storage to suit all budgets – all for prices at least 30% lower than the market average. By remaining as flexible as possible at all times, we’re able to keep every storage unit cost at market-leading lows. A new standard for London, Surrey, Sussex & Kent that never compromises on quality. If you can’t find what you’re looking for on our website, get in touch with our customer service team to discuss a custom storage solution.